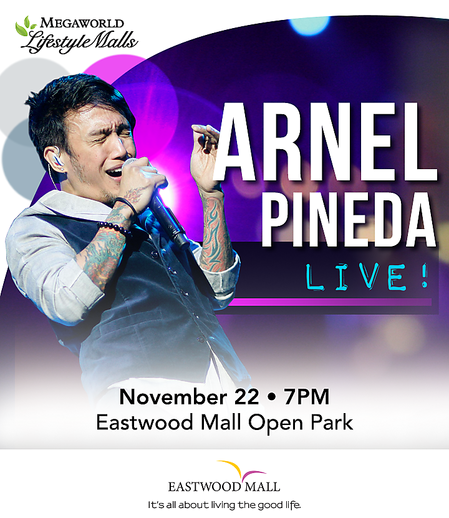 Fans of the singer-songwriter can get VIP passes to the concert by purchasing any CD of Arnel Pineda at the venue entrance. The first 20 Megaworld Citibank cardholders can also get VIP passes by showing their card at the registration booth also at the venue. The former front man of local show band The Zoo, Pineda rose to the international limelight after videos showing him with his band covering popular American ballads and Journey songs were discovered by the band’s guitarist Neal Schon on YouTube. Since becoming the lead singer of American rock band in 2008, he has led Journey to successful tours in different countries and across the United States, where he has also appeared on several TV shows and covers of magazines. In the same year, the newly formed Journey launched their first album, Revelation, which eventually became platinum. Last 2012, the band came out with Don't Stop Believin': Everyman's Journey, a full-length documentary chronicling Pineda's first years with the band and their Revelation Tour. For more details, please call Megaworld Lifestyle Malls Concierge at (63 2) 709-9888, (63 2) 709-0888 or (63 917) 838-0111.